Special occasion baking is not my forte. I love to make cookies and cupcakes and even the occasional truffle, but cakes of mine have never crept above two layers. Enter my first multi-day project cake. It turns out that tackling a huge and impressive layer cake can be completely manageable if you stretch the whole affair over a few days. This is good news because as much as I love to be in the kitchen, I do not want to spend an entire day baking, frosting, chilling and re-frosting when I have people coming over for some kind of celebration. 1. After the cake layers have cooled, wrap them tightly in plastic wrap and freeze them. 2. Allow the layers to defrost slightly before frosting to get rid of any warping from the freezer. 3. Apply a crumb coating of frosting to the cakes and chill for at least an hour before applying the final layer of frosting. My cake schedule looked something like this: Thursday night brown the butter for the cake and chill; Friday night after work bake, cool and freeze cakes; Saturday afternoon make frosting (I always make more than I think I’ll need and I always use it); Sunday morning apply crumb layer of frosting and chill; Sunday afternoon finish frosting and leave cake out for everyone to admire before serving. If you’re interested in making your own layer cake, I highly recommend the following recipe for brown butter and vanilla birthday cake. It is from Kate Zuckerman’s book about desserts from the now closed Chanterelle in New York. It is the best cake I have ever tasted and that is coming from a self-admitted chocoholic. In keeping with the multi-day theme, I’ll post the cake recipe today and the frosting recipe, along with crumb coat instructions, in a post later this week. Place the butter in a saucepan over medium-high heat. Cook the butter, stirring occasionally, until it caramelizes and emits a nutty aroma. Stir in the vanilla paste. Pour the butter into a bowl. If desired, you can pour the butter through a strainer to catch any browned milk solids that have formed at the bottom of the pan. Chill the butter for at least two hours or overnight. Grease and flour three 9-inch cake pans. Place the chilled butter in a stand mixer fitted with the paddle attachment and beat on medium for one minute. Add the sugar and beat until creamed (at least 10 minutes). Add the eggs and additional egg yolks one at a time until incorporated. Combine the flour, baking powder and salt in a separate bowl. Set the mixer to low and add the dry ingredients to the batter in three additions, alternating with the milk until both are fully incorporated. Divide the batter evenly between the three cake pans and bake for 40 to 45 minutes. Let the cakes cool slightly in their pans, then invert the cakes onto a wire rack to cool completely. If not using the cakes right away, wrap tightly in plastic wrap and freeze. Great looking cake! I agree about the crumb layer and chilling before the final frosting - it makes all the difference to for making the frosting go on smoothly. That cake looks fab. And I've never gone above two layers, either so it's great to have some handy tips for doing multiple layers. Sounds completely delicious. I'm in the process of testing butter cake recipes for a wedding I'm doing this summer, and this just went on the to-test list! Ooh! Gorgeous. I think white cake is fabulous (and often underrated!). Your cake looks delicious as is. I feel much the same as you only my least loved baking project is cookie baking. I love to eat them, just don't care much about making them. Wow. Amazing. Wish someone would make ME this birthday cake! Lovely cake. Where do you get vanilla bean paste from, I have never heard of it? Would this go well with a fruit? It looks delicious, looking forward to seeing the finished cake. That is one mighty cake! 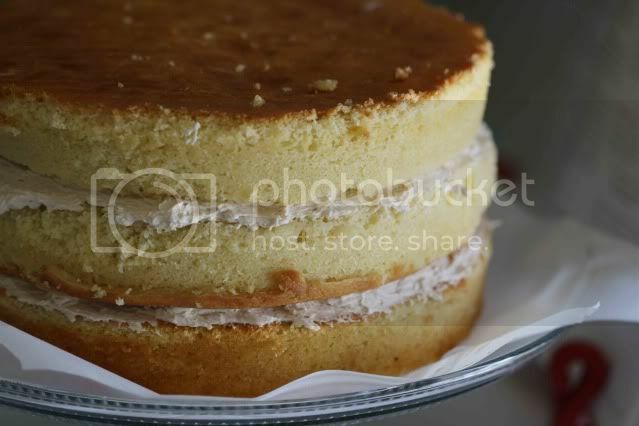 I love a good layer cake and this one sounds heavenly! I think it imparts a much more pure vanilla flavor than vanilla extract. this looks beautifully impressive. I've not gone above two layers before either. The best cupcakes I've ever made were burnt butter ones - what a revelation and I'm also a chocoholic, so can understand this being very tasty indeed. Thanks so much for posting this recipe! I made it yesterday and it was a major hit at my friend's party. I frosted it with mascarpone buttercream and added fresh peaches between layers. Btw, you're living my dream at the FCI. I also live in LA and wish we had a school like that out here (although I know a good bit of the experience is the NYC food scene). Enjoy every morsel of it! Is there a technique for smooth flat layers or do you have to cut the tops to even them? I got mine at Williams Sonoma and I find that they really make a difference. this looks beautifully impressive. I've not gone above two layers before either.